Cartoon from “Chip” (pseud. 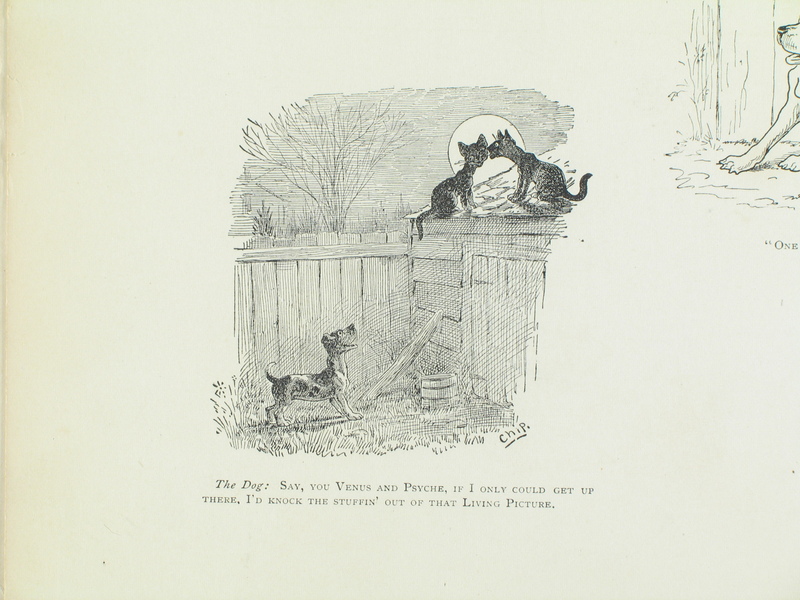 F. P. Bellew), “Chip’s” Dogs: A Collection of Humorous Drawing. R. H. Russell & Son, 1895. The trade-card saga of courting cats got me thinking about other images I might have that help tell the story of cat life in the days before spaying, neutering and all-indoor cats. This is a cartoon from a wonderful late-nineteenth century cartoonist named F. P. Bellew, who drew under the pseudonym of “Chip.” The dog, watching backyard courtship underway, says: “Say, you Venus and Psyche, if only I could get up there, I’d know the stuffin’ out of that living picture.” The dog is referring to their silhouettes in front of the full moon, suggesting that they look like a much-satirized parlor entertainment of the time. He’s also got his classical allusions mixed up: the courting couple should be Cupid and Psyche. But he’s a mutt — his classical education was probably neglected! Next And Here’s Someone Who Really Wanted His Picture Taken…..